This special committee of 9 was tasked with a mission to celebrate St. Edward’s 50th Anniversary! This group of very dedicated parishioners planned, organized and put in hundreds of hours to accomplish this feat. 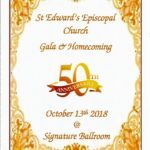 Various other ministries worked in conjunction with the 50th anniversary Committee: Parish Life, ECW, Brotherhood, Pit Crew, the Hispanic community, and the Liberian community. We kicked off 2018 with the Epiphany Wine & Cheese Party in January. During Lent, we assisted Parish Life in the annual Friday Fish Fry. In May, we celebrated “Cinco de Mayo/Under the Stars” a Chastain-like music and dinner event in conjunction with ECW & Fr. Fabio. cookout. The ECW had their annual Tea Party and we dedicated the Rose Garden in remembrance of the ladies of St. Edward’s. The 3rd event was the Liberian Food Sale hosted by the Liberian Community. celebration. Bishop Wright sent a video greeting and Canon John Thompson-Quartey served as the Bishop’s representative and keynote speaker. Former priests, parishioners – past & present, friends and neighbors attended. It was a night of dinner, dancing and fellowship. Joy Sibley was honored as a charter member of St. Edward’s. A photo slide show and silent auction rounded out the evening. Sunday, October 14th concluded the year of events with a Celebration Eucharist & Pit Crew Luncheon. Scholarship Fund. We raised over $4000 to kickoff the support of our youth. We hope to have at least one event each year to keep the scholarship funded. 50th Anniversary Tee shirts are still available for $10 with net proceeds benefiting the Youth Scholarship Fund! years of praising God at St Edward’s Episcopal Church! 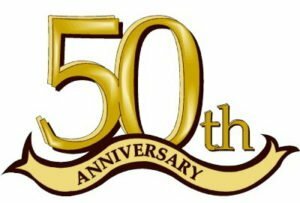 50th Anniversary Committee: Diane Van Slyke, Marvelle Martin, Jeannette Best-Nunez, Manuel Holguin, Mike Leary, Tonya Leary, Jean Okunsanya, Lee Ann Sipe, & Marlaina Woodward. Special thanks to: Fr. Gordon, Fr. Fabio, ECW, Brotherhood, Parish Life, Pit Crew, Frances Hart, Fostenal Dahn, John Talipsky Jr., John Nystrom, Samantha Toomey, the Liberian community, the Hispanic community, and St. Edward’s Vestry! Our Gala is just 3 weeks away! We have sold over 170 tickets! Gala committee members were invited to the Signature Ballroom’s food tasting. The food was DELICIOUS! The menu chosen for the gala is “Food from Around the World“. Something for ALL: Chicken, vegetarian, live chef station, desserts, and more! We have added a Silent Auction beginning after Taizé on Friday and closing out at the BBQ lunch on Sunday. Former priests and parishioners will be in attendance. Come share an evening with old friends. Get your ticket NOW while you still can! 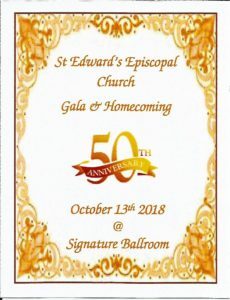 St. Edward’s Gala Committee is proud to announce the formation of a St. Edward’s Youth Scholarship Fund with the net proceeds of our Gala ticket collections. Our goal for our youth in the next 50 years is to send them off to school with lots of love and support! Please join us as we celebrate our 50 years together and look to the future by starting a fund to support our youth! If you would like to donate directly to this fund, please make your check to “St Edward’s” and write “Youth Scholarship Fund” in the memo line.